Ginger tea benefits the digestive system by increasing activity of lipase and other digestive enzymes. Learn how to make ginger tea using this simple ginger tea recipe. 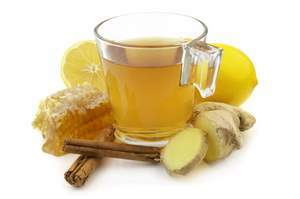 Various oils in ginger root tea aid digestion, reduce flatulence and protect the lining of the stomach. Ginger’s hot and spicy flavour comes from compounds called gingerols which stimulate bile flow Ginger can be used to treat colic and dyspepsia and contains a helpful protein-digesting enzyme called zingibain. Ginger also has anti-inflammatory, anti-nausea and antioxidant properties. Put the ginger and water in a saucepan and bring to the boil. Add herbal tea (if desired). Cover with a lid and leave to stand for 5 minutes. You can drink ginger tea cold or combine it with juice or smoothies. Leave the lid on whilst brewing helps to retain ginger’s essential oils. You can drink this tea daily to gain the health benefits of ginger root or simply to enjoy the spiciness of ginger. It is possible to have an allergic reaction to ginger, so increase your servings or dosages gradually. Use only in low doses during pregnancy and check with your medical practitioner before using ginger. If you are taking anti-coagulant (anti-clotting) medications, do not take ginger without your doctor’s permission. Find out more about the benefits of ginger root. Beckham, Nancy. (1998) Nature’s Super Foods: Top 40 Medicinal Foods, Herbs and Supplements. Lothian: Melbourne.